Bassett personnel have managed or been involved in the following projects, either here or at other companies. Bassett's experienced construction managers and engineers address all utility services and casework issues up front- building from an "inside-out" perspective- to ensure a timely and cost-efficient delivery of projects. From small, economical biology labs for start-up companies to complex bio-containment facilities for world-class biopharmaceutical corporations, Bassett's range of proven expertise provides customers with a seasoned driver equipped in planning, coordinating, constructing and validating even the most technically challenging and complex laboratories and facilities. After being assigned the responsibility of Colorado Regional Manager of DPR Construction, Dan Bassett oversaw the completion of the construction of the 200,000-sq.-ft. high-tech manufacturing facility in Fort Collins, Colorado. This is a showcase facility for Celestica in manufacturing services for the United States with potential for two additional 200,000-sq.-ft. expansions on this site in the future. 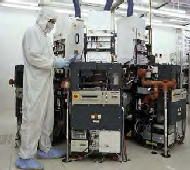 As the third largest worldwide participant in the rapidly expanding electronics manufacturing services industry, Celestica provides a full range of services including design, prototyping, assembly, testing, product assurance, worldwide distribution and after-sales service to its customers in the computer, telecommunication and related industries. 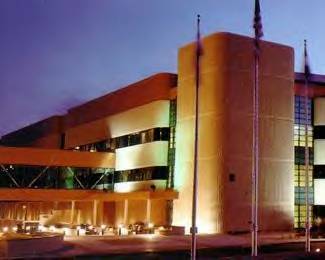 The first building included a manufacturing facility with clean rooms, a warehouse equipped with trucking dock, cafeteria, break rooms, offices, lobby, customer briefing center, conference rooms, nurse station, security office, failure analysis labs and calibration labs, product modeling shop and mail room. 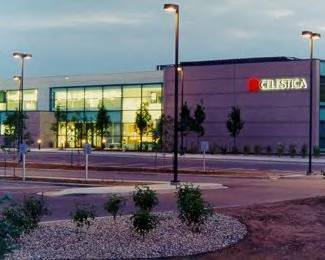 Bassett and the rest of the DPR team�s commitment to customer satisfaction was evident: on a performance survey, Celestica reported that the project team "exceeded" or "far exceeded" expectations in eight categories. Accurate scheduling and constant communication with Celestica allowed for timely progress, as well as early move-in times for production equipment. While with Jacobs, Dan Bassett worked with Rockwell to establish the budgets and oversaw pre-construction activities. This assured that the Contractor (DPR Construction) maintained cost estimated values throughout the design and construction phases. 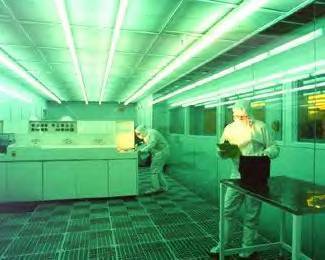 This Rockwell Semiconductor Systems project (actually two wafer fabrication facilities within a single 240,000 sq. ft. building) is one of the largest and fastest projects. The $125 million design/build project was completed on schedule in less than 12 months despite winter weather setbacks and a confined site that required precise coordination of the 800 workers on site. The Rockwell project utilized a 18,300-item microelectronics cost database established by Dan Bassett and his pre-construction team, which is tailored specifically to such large semiconductor projects. Adjoining buildings incorporate state-of-the-art process tools capable of producing 0.35 micron geometries. A central plant building was also included in the project. Although market downturns forced Rockwell to suspend completion of the project, Rockwell Senior Project Manager Frank Shukis stated that the project was a huge success. By working around-the-clock seven days a week and precisely coordinating the overlapped progress of different tradespeople, Bassett built new diffusion, etch and lithography fabrication areas for Rockwell Telecommunications in just six months, including the tool hookup. The schedule was considered "impossible" by some, but brought rave reviews from Rockwell officials when the technically demanding job came in ahead of schedule. In just four and a half months, the clean rooms were fully functional and ready for the exacting process tool hookup, which Bassett completed in the next six weeks. At the outset, Bassett established a mission statement and project goals in close cooperation with Rockwell officials, two steps which were considered vital to the project�s stunning success. The project included building 17,500 sq. 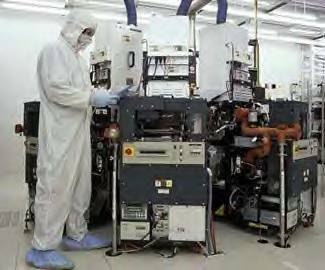 ft. of Class 1 clean rooms to house Rockwell�s 8-inch wafer fabrication process. To support the expanded fabrication area, Bassett directed upgrades on the existing central plant that included 3,500 tons of new chiller capacity and 10,000 tons of new cooling tower capacity. Main electrical service upgrades were also carried out. To serve the fab area, parts-per-billion specialty gas systems and bulk gas systems were installed. Bassett also constructed a new bulk chemical building that housed all specialty gases and wet chemistry pumps. Bassett expanded LSI Logic�s infrastructure and tool configuration. Bassett worked closely with the LSI Logic to place pre-facilitation material orders for long-lead valves and other materials to meet the aggressive tool delivery dates set by the individual tool managers. Each tool required extensive preplanning and coordination to ensure that all utilities were complete prior to the tool components arriving on-site. The challenges of working on over a dozen tools simultaneously and coordinating with as many tool owners on a daily basis was no easy task, but through Bassett's Site Incident Prevention Program, we were able to eliminate any impacts to Fab production. Prior to completion of the LSI 2500 WSW C9 Capacity Expansion Project, Bassett�s project team was able to turnover 99% of the O&M�s, as-builts, SL1 & SL2 Documentation to be reviewed and accepted by the owner for a clean and crisp project closeout. Sensitivity is a top priority in health care planning and construction. Bassett takes proactive measures to minimize the impact of construction on occupied buildings and the surrounding community. Whether it's a clinic, hospital or congregate care facility, Bassett provides creative solutions to improve quality and speed of project delivery. With the precision of a surgeon, Bassett experienced technicians closely track the industry's ever-changing regulatory requirements and continuously hone their skills, keeping abreast of the latest standards for medical equipment, mechanical systems, room pressurization and utilities interface. This six-story, 270,000-sq.-ft. parking structure was developed as part of a joint venture project by The Children�s Hospital and Exempla Saint Joseph�s Hospital. The cast-in-place structure provides close to 900 spaces to be shared equally among the employees of the two hospitals. 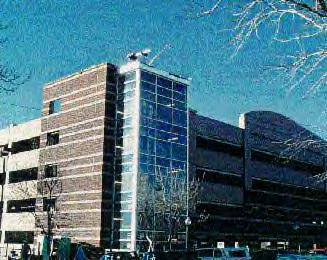 Once Dan Bassett was assigned the responsibility for success of the Colorado Region he and his project team worked diligently to accommodate the requests of both owners and ensure equal access between the two hospitals. Dan Bassett and his project team worked closely with Carl Walker & Associates, which specializes in parking design, to generate an innovative traffic pattern in the garage that allows street entrances from each hospital. Located on a hill, the garage required a split-level design with one entrance on the first floor and the other on the second, making the street elevations different. Two separate employee card access systems also had to be installed. Stairways and elevator shafts were built on opposite ends of the building with sheer curtain wall glass for added security. The design/assist project was just beginning when Bassett discovered mistakes in the DPR estimate, quickly post-tension concrete was incorporated into the design to meet the project�s fast-track, eight-month deadline set by the hospitals. 480 to 500 cubic yards were poured per day, which is equivalent to about 50 trucks worth of concrete. Dan Bassett and his project team also coordinated with Denver public utility companies to secure and relocate electrical power, telephone and a 16-inch natural gas line that ran through the middle of the lower levels of the parking structure for nearly 3 months. Crews were also sensitive to building around two operating hospitals, taking extra precautions not to disturb the patients and visitors during construction, which also included landscaping around the structure and the addition of street and pedestrian lights. With a huge contract riding on KPMG Consulting's move to its new Rocky Mountain Broadband Solution Center early this year, they and representative, developer CarrAmerica, turned to Bassett to make it happen. 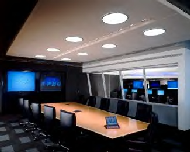 Approximately a month into construction KPMG Consulting discovered it needed to push the original "go live" date for the project up by two weeks in order to accommodate a billion-dollar contract with a major client. On top of that, the space to be built out more than doubled, from an original floor plan of 15,000 sq. ft. to a final count of almost 36,000 sq. ft.
No ordinary office space, the ultra high-end build-out will be used to showcase KPMG Consulting's broadband internet solutions for large, Fortune 500 customers. The luxury quarters feature everything from the specially crafted anigre wood doors and conference tables to cutting edge audio and video systems. Designed by RMW, San Francisco, the project also included such unique architectural finishes as MDF panels in feature presentation areas that were custom fit and then sent out to receive an automotive paint job in white, black or silver, snap-in graded metal ceilings, touch panel black-out shades and projection screens, and accents of brushed chrome, aluminum and stainless steel throughout. When the owner informed Bassett that it needed to shave two weeks off the schedule, the project team called an all-day meeting with "every foreman and project manager" from each of the subs on the job to find a way to accomplish it. That meeting took place just two months before the owner needed the "Temporary Certificate of Occupancy". In addition to committing to keep the project rolling seven days a week, the team identified areas where time savings could be made and pulled together to make it happen. Web-hosting. Co-location. Telecom. Data processing. Call Center. 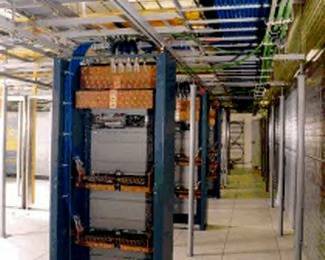 Bassett's proven technical expertise hyper-tracks the delivery of mission critical facilities. Every day presents new opportunities for exploring alternative techniques to improve design and construction in a 24x7 environment. Bassett's building specialists look at each project with a fresh approach to provide the right team and services for the job. 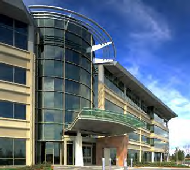 Offering customers a single point of contact and up-front collaboration to shorten schedules and control costs, Bassett takes the process to new heights with its program management, construction management and design/build capabilities, ensuring that facilities are ready to ramp up to full running capacity immediately upon completion and continue operating without failure. Bassett is currently building out 30,000 sq. ft. of vacant space located in two stories into an Internet data center, as well as modifying and expanding an existing central plant. While Colorado Regional Manager for DPR Construction, Dan Bassett convinced TeleTech to choose them as contractor to construct their new global corporate headquarters building near the Denver Tech Center. Dan brought the project budget in line from previous attempts with other contractors by suggesting value added options which significantly reduced costs. Dan quickly assembled a highly qualified team of professionals to complete the initial core within the 9 months schedule constraint, and personally negotiated the rigid contract and oversaw all aspects of the subcontracts and schedule. TeleTech is the leading provider of integrated, e-commerce-enabled customer management (eCRM) solutions for global organizations. Six months into the project, the Colorado political climate coupled with changing corporate plans reduced construction of the planned headquarters facility to a 131,000-sq.-ft. 4-story core-and-shell office for resale in the Denver market. The building is situated on 12 acres in a park-like setting with mountain views. The exterior is comprised of green-colored floor-to-ceiling e-glass windows with metal panels over a precast skin. The lobby area showcases a terrazzo mosaic floor with two elliptical aluminum columns. Bassett worked hand-in-hand with Teletech to reduce construction costs through aggressive value engineering totaling over $600,000. Bassett's challenges included a very aggressive schedule and changes in owner's end use of facility. Email webmaster with comments. Copyright � 2005 Bassett Construction Services.